﻿﻿S﻿ynopsis : From the critically-acclaimed author of THE BROKEN EMPIRE series comes a brilliant new epic fantasy series, THE RED QUEEN'S WAR. 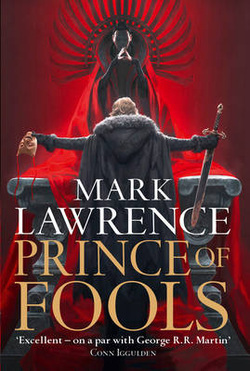 'If you like dark you will love Mark Lawrence. And when the light breaks through and it all makes sense, the contrast is gorgeous' ROBIN HOBB The Red Queen is old but the kings of the Broken Empire fear her as they fear no other. Her grandson Jalan Kendeth is a coward, a cheat and a womaniser; and tenth in line to the throne. While his grandmother shapes the destiny of millions, Prince Jalan pursues his debauched pleasures. Until he gets entangled with Snorri ver Snagason, a huge Norse axe man, and dragged against his will to the icy north. In a journey across half the Broken Empire, Jalan flees minions of the Dead King, agrees to duel an upstart prince named Jorg Ancrath, and meets the ice witch, Skilfar, all the time seeking a way to part company with Snorri before the Norseman's quest leads them to face his enemies in the black fort on the edge of the Bitter Ice. PRINCE OF FOOLS is the first book in the series.